It's not often you get a chance to spot an asteroid in our night sky. And though the task will be challenging, experienced backyard astronomers will give it a go this weekend. A large asteroid will make an exceptionally close approach to our planet early on July 3, passing just beyond the Moon's average distance from Earth. The space rock is named 2004 XP14. There is no chance of a collision, but professional astronomers are keeping an eye on the object, too. Asteroid 2004 XP14 is an Apollo asteroid, a class that cross Earth's orbit. And there are two other classes of asteroids that possess orbits that can also take them tantalizingly near to the Earth: the Atens and Amors. How close will 2004 XP14 be? An astronomical unit (AU) is equal to 92,955,807 miles (149,597,870 km). The latest calculations show that 2004 XP14 will pass closest to Earth at 04:25 UT on July 3 (12:25 a.m. EDT or 9:25 p.m. PDT on July 2). The asteroid's distance from Earth at that moment will be 0.0028898 AU, which translates into 268,624 miles (432,308 km), or just 1.1 times the Moon's average distance from Earth. Many older astronomy texts (those written before 1980) often would cite an extremely close approach in 1937 by the asteroid Hermes, which on Oct. 30 of that year passed within 460,000-miles (740,000 km.) of Earth. That was usually referred to as the all-time closest approach of a celestial body (other than the Moon) to the Earth. It was always thought that Hermes very close approach-less than twice the Moon's average distance from Earth-was highly unusual; almost a unique case. But in the last quarter century, we've come to realize that the approach of an asteroid to within less than half a million miles of Earth is far from uncommon. A case in point: so far in 2006, we have already had two asteroids approach closer than Hermes did in 1937. But these two asteroids were estimated to be no larger than about 66-feet/20-meters across. 2004 XP14 on the other hand, is probably about 30 times larger, though for now astronomers can only say that it's between a quarter-mile and a half-mile wide. And as close as 2004 XP14 will come [Map], another object on the Potentially Hazardous Asteroid docket is destined to pass much closer to Earth and possibly could pose a threat to our planet. 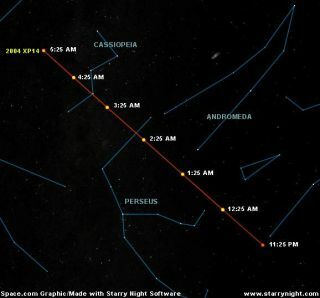 On April 13, 2029, the asteroid 99942 Apophis is expected to pass a mere 18,600 miles (30,000 km.) above Earth's surface. While there is no chance that a collision will occur, there are some, like former Apollo astronaut Rusty Schweickart, who have voiced concerns that after the scarily close 2029 approach that Apophis' orbit could end up in resonance with Earth's orbit. In fact, if Apophis were to pass through a narrow "gravitational keyhole" there would be a small possibility of a collision in 2036 or 2069. Right now, however, the probability of such an impact is placed at 1-in-28,000. So we now know that close encounters with asteroids happen with far greater frequency than was once thought and that Earth has close brushes with such cosmic rocks and boulders fairly regularly. These typically range from the size of a house to perhaps half a mile or more in diameter. Fortunately, the overwhelming majority of these stones miss the Earth, but close encounters like the one with 2004 XP14 this weekend gently reminds us that we're literally in a celestial shooting gallery. Normally with such a relatively small asteroid as 2004 XP14, its peak brightness would fall into the Pluto category, that is, it becomes no brighter than magnitude 13 to 15 and is only available to the most assiduous amateur astronomers and professionals with large instruments and sophisticated equipment. However, the combination of its size, plus its very close approach should cause the asteroid to brighten briefly to 11th magnitude. This is still about a hundred times fainter than the faintest star visible to the unaided eye. Yet, those who have access to at least an eight-inch or (preferably) larger telescope with moderate-to-high magnification and blessed with dark, transparent skies and steady seeing probably have a good chance of catching a glimpse of it. And another factor that should allow observers to make a positive identification is the asteroid's quick motion among the background stars-probably more noticeable than carefully watching the minute hand of a clock. In fact, during the night of July 2-3, 2004 XP14 will appear to streak rapidly across the star background, moving at roughly 7 to 8 degrees per hour. The asteroid will appear to speed on a northward trajectory. As darkness falls across North America on Sunday evening, July 2, the asteroid will be situated along the border of the constellations Aries, the Ram and Taurus, the Bull. It will then rocket between the stars of Perseus and Andromeda and between 7:00 and 9:00 UT, it will cut straight across the famous W of Cassiopeia [Sky Map]. For more technically inclined SPACE.com readers, a custom ephemeris (a table giving the coordinates of the asteroid for any number of specific times during a given period) can be generated by going to http://tinyurl.com/hqkn8. 2004 XP14 will approach Earth ten more times during the next 82 years, but this weekend's will be by far, the closest. On July 4, 2061, it will make its next closest approach to Earth: 3.12 million miles/5.04 million km away. As far as we now know, the next very close approach of a Potentially Hazardous Asteroid will come on November 8, 2011, when 2005 YU55 skims Earth at a distance of 98,000 miles (158,000 km.) That's less than half the distance of this weekend's close encounter with 2004 XP14.